We can change the chart title font styles in excel like font Size, Color, Bold, Underline in Excel. 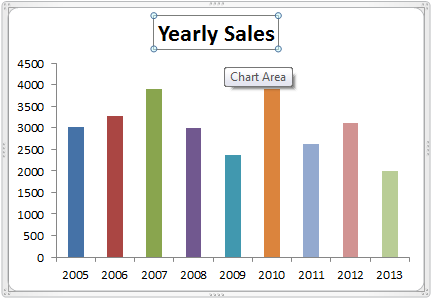 Your chart will looks great if change the chart styles in Microsoft Excel 2003,2007,2010,2013. Her we will see how to change or set the font styles.How to change the font size, font color, bold and underline in Excel. The following step by step approach will explain you how to change the chart title font styles in Excel. 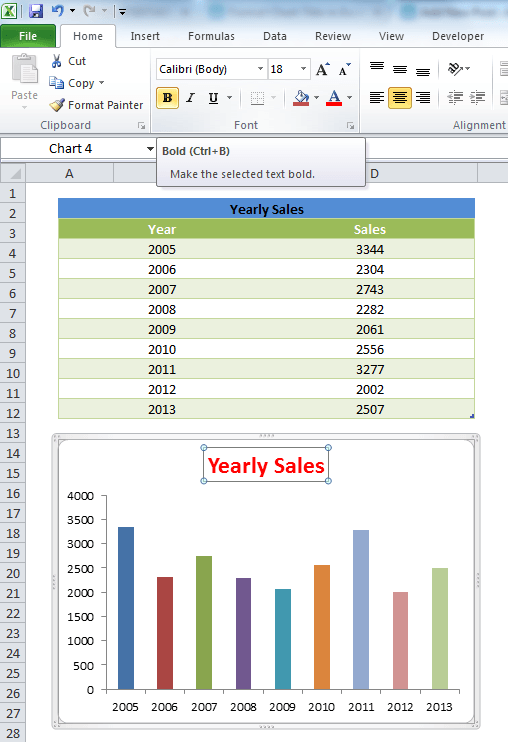 We will see setting font styles like font size, font color and making font bold and underlines in Excel. Select a Chart title to change the font styles in your Excel chart. The following is the exaple scree-shot to show you chart title selection. Now go to home tab in the ribbon menu and change the required font styles from the font group of the Home tab in the Ribbon menu. You can change to required font style from styles drop-down. You can change the font to bold by clicking the Bold command (B) in the font group from the Home Tab in the Ribbon menu. You can change the font to underlined by clicking on the Underline command (U) in the font group from the Home Tab in the Ribbon menu. You can change the font Size by selecting the required size from the font size drop-down in the font group from the Home Tab in the Ribbon menu. You can change the font Color by selecting the required color from the font color drop-down in the font group from the Home Tab in the Ribbon menu. Here is the example screen-shot to show the fonts group in the Home tab.